If you have ever dreamed of a fairytale wedding in an 800 year old castle set amongst 350 acres of luscious green that is the Emerald Isle then look no further! Ashford Castle, Hotel and Country Estate in County Mayo, Ireland is well.. AHHHMAZING! Part of the gorgeous Red Carnation Hotels group and voted one of the Best Hotels in the World, by Virtuoso in 2015, it is the perfect spot for your dream fairytale wedding or luxury honeymoon. On our recent stay we fell in LOVE LOVE LOVE with this property, its history, the grandeur, picturesque grounds, cuisine and flawless service. Treated like royalty from the moment we stepped foot out of the car, I just knew I wouldn't want to leave EVER, especially when the welcome glass of champagne was offered at check in. (Tea and coffee were also options). Ashford was undeniably WOW from the get go. 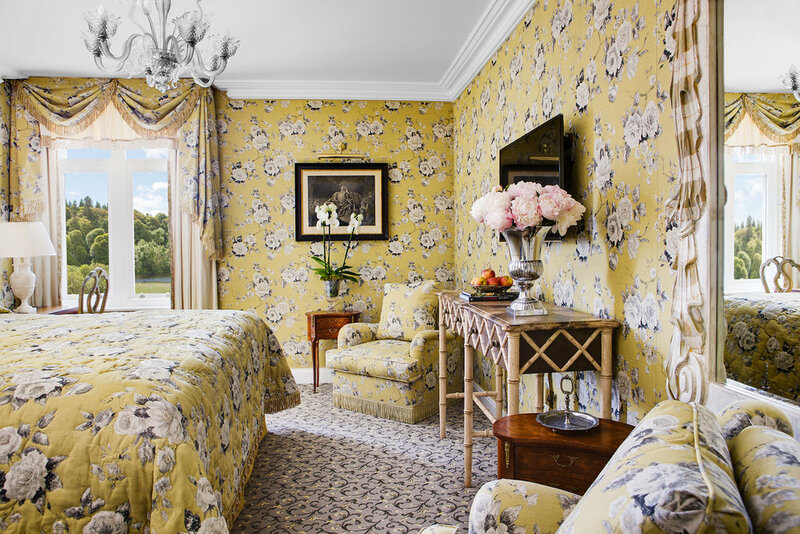 Lovingly restored, the castle has 83 individually designed guest rooms and suites. No two are the same. The luxury is beyond comparison, beautiful fabrics, antiques, and artwork fill each room. The Reagan Presidential Suite (named after President Reagan who stayed at the castle in 1984) is a favourite for brides. Situated in the oldest wing of the Castle, the split level suite has unforgettable views of Lough Corrib from its floor to ceiling windows, original fireplace, an antique George III four poster bed, handpicked antiques and original artwork and wait for it, his and hers bathrooms. The suite can also be combined with two adjacent rooms to complete a three bedroomed wing of the castle perfect for your bridal entourage. Couples have the option of having their wedding ceremony on the grounds of Ashford or at nearby St Mary’s Catholic Church which is only a short stroll from the castle. Once married, there are several options to choose from, depending on the size of the wedding. Intimate receptions can be held in either the Inglenook or Conaught rooms. Larger weddings with guests between 130 and 160 would of course have exclusive use of the castle and hold the reception in the George the V Dining room which boasts 11 Waterford Crystal Chandeliers. They are SPECTACULAR! Foodies will be right at home at Ashford - all our meals were of course DELICIOUS! A leisurely lunch was had in the Drawing Room overlooking the grounds and lake, pre-dinner drinks in the Prince of Whales Bar, followed by dinner in The Dungeon where more traditional Irish dishes are on offer. After dinner we explored the castles interiors which they encourage. There are hallways showcasing the castles history and past guests, including John Wayne, Princess Grace of Monaco, Nancy & Ronald Reagan, Robin Williams, Pierce Brosnan and Brad Pitt to name a few. Breakfast the following day was served in the beautiful George V Dining room, where you have the choice of Continental or A-la Carte breakfast. Might I say.. I am still craving the buttermilk pancakes - sooo good! Afternoon tea in the Connaught room is extremely popular (we missed out) so we strongly suggest pre booking this once you decide on visiting the castle. Loved up honeymooners choosing to visit Ashford will be spoilt for choice in terms of activities. It’s no secret we are partial to some pampering here at LWF so we highly recommend booking in for some his and hers luxurious pampering at the Spa. If however, your partner is one of those annoying outdoors can’t sit still type - rest assured there is plenty to do! Choose from classic country activities such as archery, clay pigeon shooting and falconry to a spot of golf, horse riding or simply spend hours strolling through the estate gardens. They even have wellies and coats available for guests to roam the property comfortably. And whilst the romance of Ashford suggests its perfect for lovers, it is also a fantastic spot for families. The kids, (even your pampered pooch) are more than welcome and will love the daily matinee in the plush 32 seat cinema (you have complete control of the popcorn machine! ), billiards room, tennis courts, cycling, tree climbing and zip lining. Lastly you must not leave Ashford without going for a leisurely morning stroll with the Irish Wolfhounds Cronan and Garvan. These gentle giants are a delight and John our guide had a wealth of knowledge of the grounds and history of the castle. The walk was a beautiful start to the day all be it -4 degree, it was well worth it with vistas over the Lough Corrib that were just breathtaking. Treated like royalty from the minute we arrived our stay at Ashford Castle was simply unforgettable and an experience we will never EVER forget.